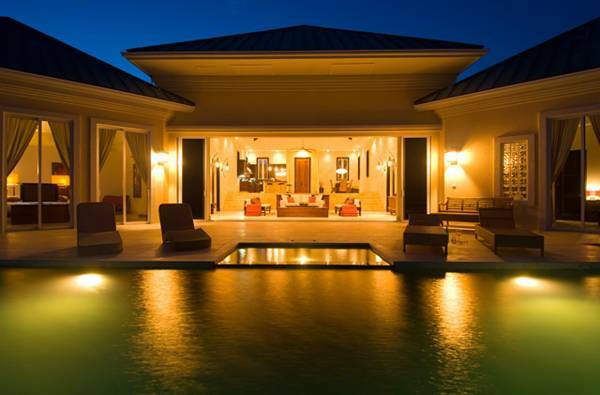 Villa Balinese is a luxury oceanfront villa located on the south shore of Providenciales in Turks and Caicos. Its unique design creates an exciting architectural coupling of the finest in Caribbean style and exquisite Balinese interior themes. 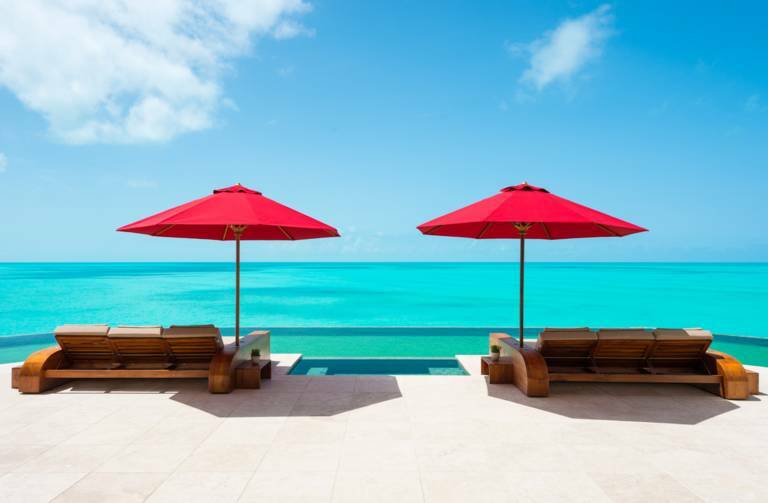 This Luxury Villa built on an elevated crescent-shaped ridge overlooking the Caribbean waters of the Turks and Caicos Banks, is surrounded by the clear blue panorama of spectacular ocean vistas and cooled by the constant tradewinds. 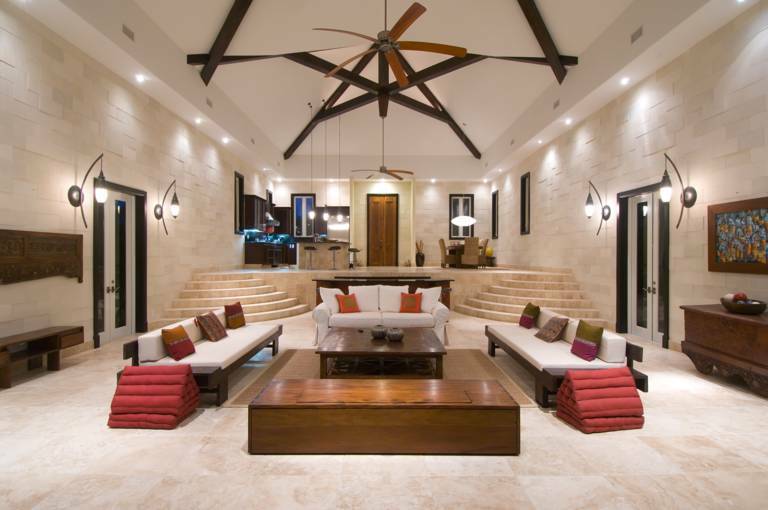 Here is an extraordinary vacation home with simply the best of everything. The villas's exterior entrance features a 75' x 39' river-stone bank of cascading waterfalls flanked by a row of coconut palms. 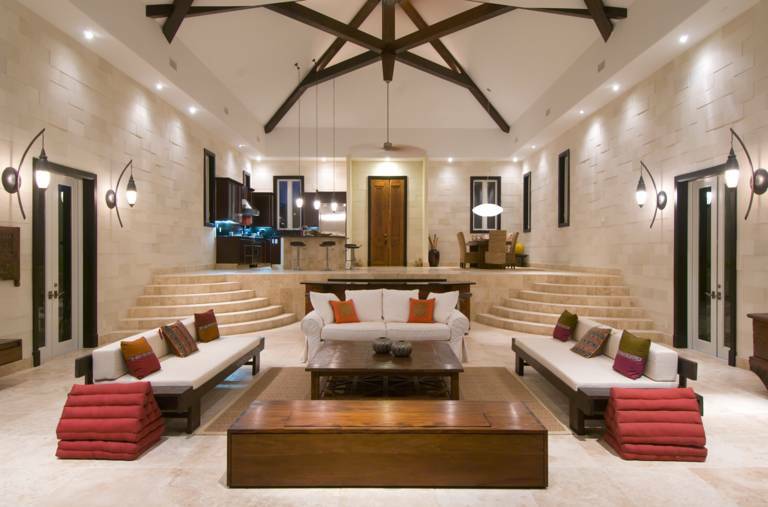 4,200 square feet of interior space begins with a greatroom of vast proportions and bold design. Travertine marble flooring, towering 30' vaulted ceilings of cedar beams, and walls of intricately patterned Asian pearl-stone tiles. 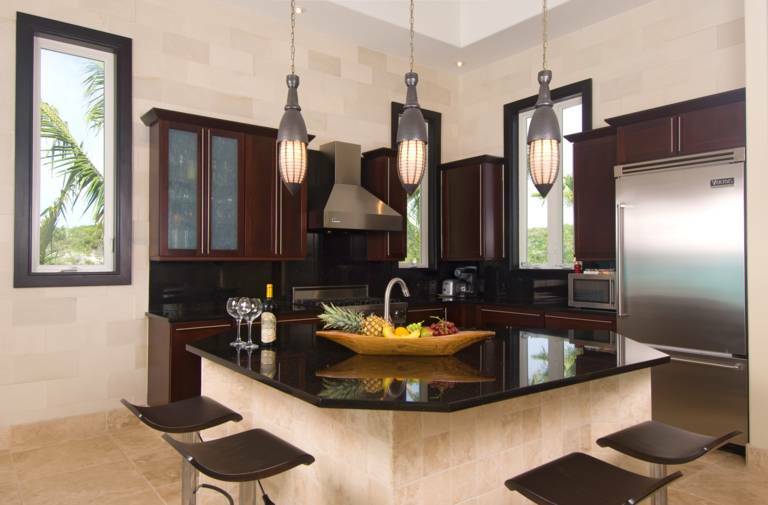 The kitchen off to the right is a gourmet chef's delight with clean lines, stainless steel Viking appliance, 6-burner gas stove, custom wood cabinetry, black granite countertops and center island counter with stools for informal dining. 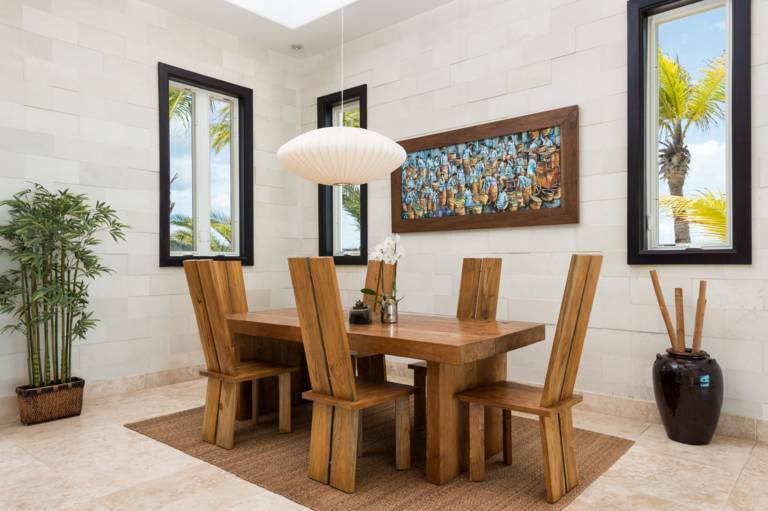 A formal dining area to the left is furnished in Indonesian teak providing seating for 6. Stunning ocean views fill the entire great room as one progresses to a large sunken living room with adjoining granite bar, including icemaker, fridge and wine cooler. 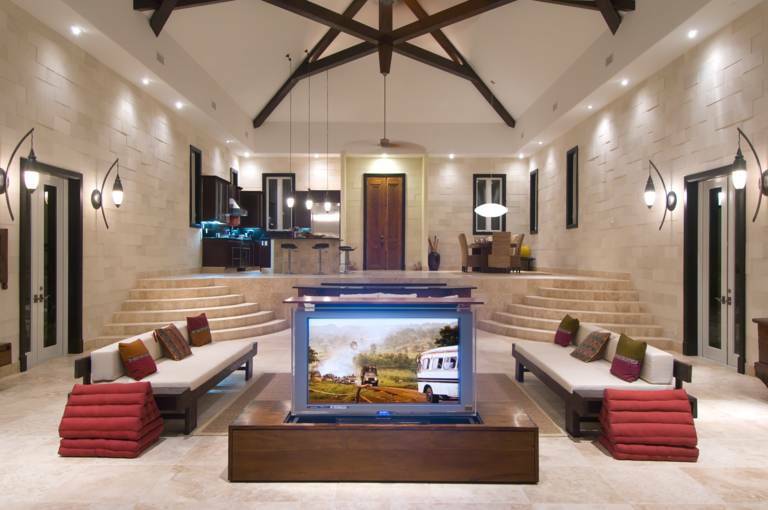 The 50" plasma TV and music center is recessed beneath low cabinetry and raised by hydraulic control for viewing. 25' x 39' high pocket wall to wall glass doors recess and expand the living room to the large outdoor pool terrace overlooking the Caribbean sea. 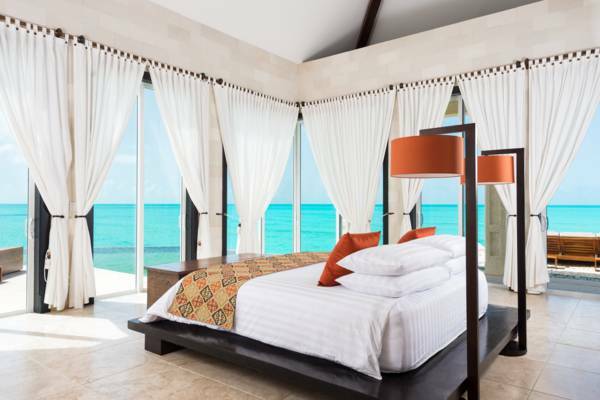 The master bedroom wing adjoins the angular pool and comprises a 35' x 39' suite with 90 degree glass doors looking out to sea, from which one steps directly into the pool. 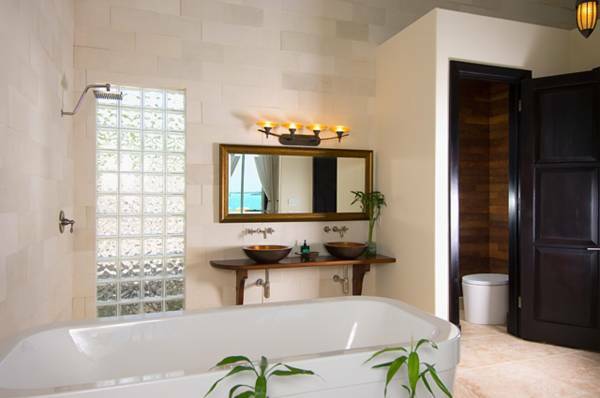 Merged with the suite is a raised bathtub featuring overhead waterfall showerhead, next to a separate shower alcove. Double vanity, vessel copper sinks, separate WC, walk-in closet lined with coconut wood walls, and custom mahogany shelving, complete the arrangement. The suite has its own private courtyard terrace with carved Indonesian day-bed to further indulge in the sensual coastal surroundings and southeastern breezes. 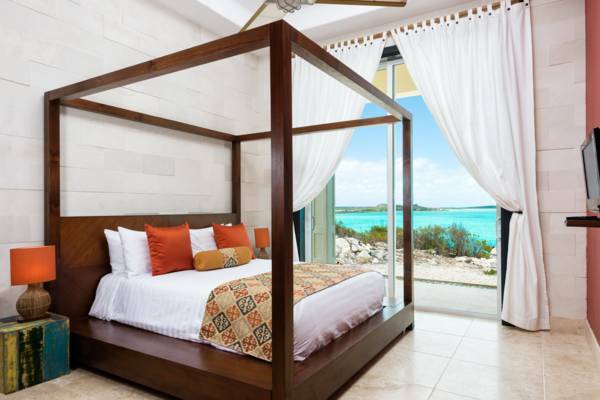 The opposite wing houses two ensuite oceanview bedrooms, each with wall to wall glass doors giving access to poolside. The second guest room also embraces the angle of the swimming pool and has steps leading into it. 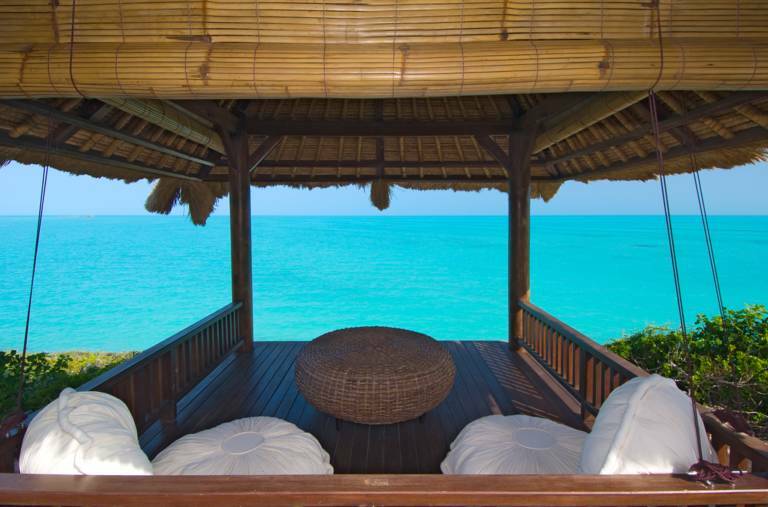 Each of the guest rooms have a private balcony furnished with handcrafted Balinese daybeds. Furnished with impeccable taste and style in a mixture of imported Balinese-Indo style with superior hand-made contemporary and antique pieces, ornamentals and artwork, the villa is replete with custom design elements of innovation and functionality. The stunning centerpiece of the luxury Villa's living and terraced pool area is the three-angled oversized infinity pool constructed in emerald green stone; the pool spans the house's breadth and is embraced by its two extreme angled bedroom wings - together, forming a hexagon. An arched pool bridge spans the pool at one end. Cascading over the main pool is a rectangular 8' x 5' infinity edge heated Jacuzzi pool. Both cascading pools create a dramatic visual connectivity to ocean below. A limestone walkway leads to the ocean, via a coconut and 'alang alang' thatched gazebo furnished in meditative Asian pieces, and roll-down straw blinds - a perfect spot for daily massages, or contemplating the soothing waterfront environment. The pathway continues down to the ocean, accessed by several steps for a delightful swim. Villa Balinese is a place of joyful karma, a oceanfront vacation villa of bold and seductive elements in a uniquely beautiful Caribbean setting. You will want to return. 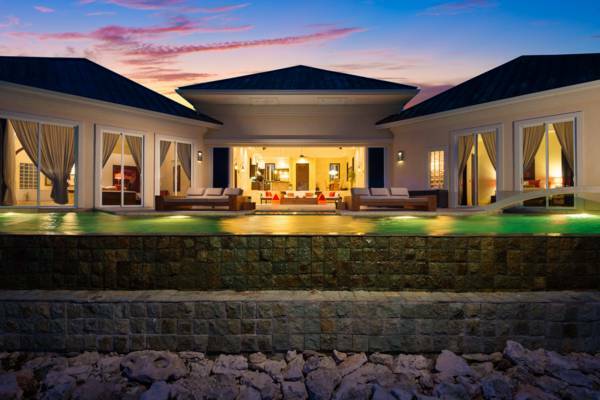 The Villa is a 2-minute drive to a small beach, and a 10-minute drive to the Grace Bay beaches and resort area. Similar distance to grocery shopping, restaurants, airport, etc. 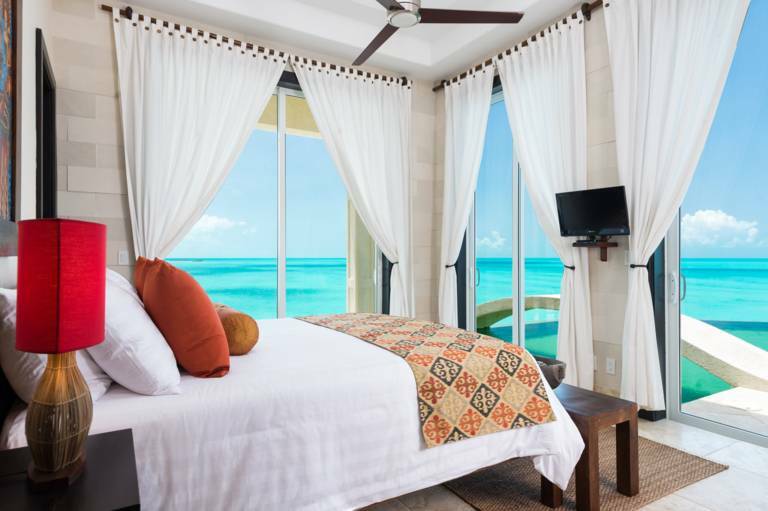 Master Bedroom (see photo): King bed overlooking the ocean. Guest Bedroom 1 (see photo): Queen bed with ocean views. Guest Bedroom 2 (see photo): Queen bed with ocean views. Master Bathroom (see photo): En suite bathroom with shower alcove and raised bathtub with overhead waterfall showerhead; separate WC, double vanity copper vessel sinks. Guest Bathroom 1: Walk-in Shower; vanity sink. Guest Bathroom 2: Shower and tub combo. Air conditioning metered and charged at market rate. Upon arrival at Balinese, our villa manager will show you the power meter. Montville, NJ Thank you for sharing this slice of Heaven! Balinese is just amazing. We had an incredible week enjoying this beautiful island, beaches, restaurants, fish fry, golf, shopping, and most of all, making new memories! We came to this villa because friends of ours were here a few years ago, and in honor of his memory we wanted to share some of his experiences on this Island. We had many nights of "Granpa's" card game, laughs, cocktails but most of all memories to talk a lifetime about! PHENOMENAL! Our time at Villa Balinese was such a delightful experience. The view was second to none and our time there erased all our worries and stress away. I am so thankful to the owners for sharing their magical spot with us. They thought of every detail to make sure their guests are completely taken care of. It's hard to describe how beautiful the colors of the water are there. Simply breathtaking!! Actually speechless! The view is unbelievable. The villa is awesome. We came down to celebrate my fiance's dirty thirty and to escape reality for a much needed relax time. Our first 7-day vacation together without kids. Awesome!! Staying here has recharged our souls. I hope this view is forever embedded in my memory. The electric turquoise water expands forever and is amazing. The water here in Provo is by far the lightest blues we've ever seen in the ocean. We had a blast! Fish fry is always great on Thursday! Explored the island a few times (hard to leave this villa even for a few hours). Even had a dance off on the patio deck! Great food - great drinks. It's going to be very difficult to leave this place! We will be back. Thank you for opening your villa to us...best vacation ever!